Mary Magdalene occupies a curious middle ground between philosophical arthouse movie and Easter-themed faith film. Although generally true to Biblical traditions associated with the title character, the filmmakers avoid overt references to the synoptic gospels’ text and invent various elements for purely dramatic purposes. 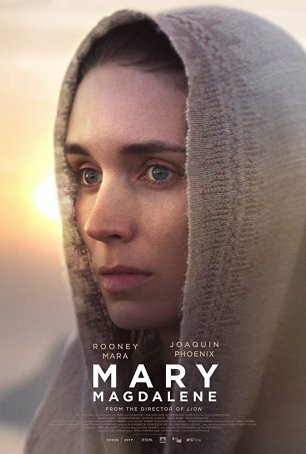 Since little is known about the historical Mary Magdalene (although her existence as a person is generally accepted by scholars), the film cherry-picks the scant details of her life available in the Bible and fills in the blanks with gorgeously-filmed but overlong panoramic shots and quasi-political arguments among Jesus’ apostles. There are no real characters in Mary Magdalene – only icons. Actress Rooney Mara does what she can with the role but she isn’t helped by a one-dimensional script whose sole purpose seems to be to turn Mary into a first century feminist crusader. She has existential discussions with Jesus, argues with the apostles, and becomes a favored figure during the resurrection period. As Jesus, Joaquin Phoenix crafts a thoughtful, ambiguous portrayal. The interpretation doesn’t provide much psychological insight into the character, however, although one could argue that’s appropriate since Mary is the film’s central figure. We see Jesus through her eyes. Cheiwetel Ejiofor’s Peter exists primarily to provide a foil for Mary. Tahar Rahim plays Judas as a tragic individual whose transformation from loyal disciple to betrayer is fueled by his belief that Jesus deceived him regarding a reunion with his (dead) family. Mary Magdalene transpires in Judea circa 33 A.D. The movie begins by introducing the title character, a twentysomething Hebrew woman who is presented as independent-minded, deeply caring, and spiritual. When she rejects a marriage arranged by her father and brother, she is subjected to an involuntary exorcism, since the prevailing view is that her behavior must be caused by a possession. When the itinerant preacher Jesus arrives, he assesses Mary and pronounces her to be free of demons. She subsequently gives up everything to follow him, becoming his only female apostle. She forms a close relationship with Judas but is often in contention with Peter. She is witness to Jesus’ crucifixion, burial, and resurrection. An interesting aspect of the screenplay postulates that the Apostles may have had differing interpretations of some of Jesus’ pronouncements. For example, is the “Kingdom of God” intended to be a real-world goal or a spiritual metaphor? Peter speaks of organizing forces to rebel against the Romans. Mary argues against this reasoning. Judas’ ambivalence about what Jesus is promising leads directly to his actions following the Last Supper. One reason why the movie seems so emotionally hollow is because the relationship between Mary and Jesus, which is supposed to be at the heart of the story, isn’t developed in a meaningful fashion. The two occasionally converse but there’s no sense of chemistry or connection. Phoenix’s interpretation of Jesus is that of someone who, despite his kind eyes and gentle bearing, is detached. The movie is also careful not to create any sense of a physical attraction between the two (although the apocryphal “Lost Gospel” claims they were married). Director Garth Davis, who gave us the emotionally riveting Lion, takes a step back from the characters, observing from a distance. There’s a sterility to the simple beauty of the terrain (with parts of Italy standing in for Palestine); there are times when, had I not known otherwise, I might have assumed that Terrence Malick was behind the camera. The tone is languid – quite a change from such well-known Bible movies as Mel Gibson’s visceral The Passion of the Christ and Martin Scorsese’s daring, convention-challenging The Last Temptation of Christ. Mary Magdalene mostly plays it safe and, despite its feminist slant, feels conservative. That might be considered by some to be a positive quality if the movie was more apt to arrest the attention than induce sleep.